Yesterday we woke up late. Rainy morning. Again. Only Thursday... I rolled over and said to Huz "You should take today and tomorrow off and we should go on a holiday". I say it lots. This was nothing new. Then I asked him "What do you have on today?"... "Nothing special" was the reply. Weird. Huz almost always has a meeting or something planned. Today was just regular work. "Ok. I have a couple of days leave..." And after a little muddling around, we were on the ferry, with three owlets and a dog, on the way to Bruny Island. So far we've seen a beautiful sunrise with white capped peaks in the background, bunnies hopping around a remote light house, beautiful beaches, delicious lunch, loads of history and dolphins swimming at sunset. Betty is loving the scenery too... Wow, this week really picked up! I'm excited about tomorrow. How lovely! I would love to do things like this on a whim. What gorgeous scenery you have there. Wow, I might have to try that one when I wake up. Beautiful photos, dolphins, soooo dreamy. Enjoy your trip. Ooooh I love it when this happens. So rare and so exciting. 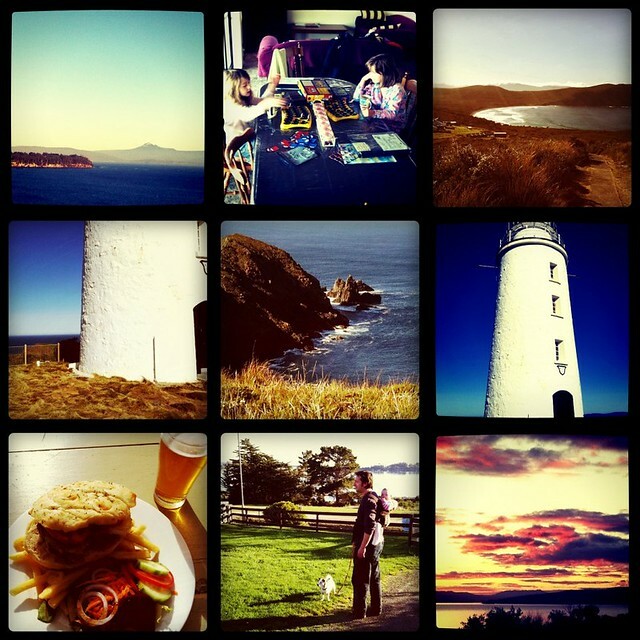 Bruny Island sounds wonderful. Enjoy the rest of your weeekend! Wow, that looks like an amazing place!